If you thought you knew about all the cryptids, think again! Have you heard about the giant sloth creature of the South American Rainforests called Mapinguari? Also called Isnashi, the Mapinguari is a huge creature known to be one of the scariest beasts. Though a common belief is that this legendary creature had become extinct long ago, there have been some sightings reported and some speculations that they still can be found in the deep jungles of Bolivia and Brazil. It is said to be more than 7 feet in height. There have been several physical descriptions provided for the Mapinguari by different people. The most common physical features to attributed to the creature are; a single large eye, an additional mouth in its belly area, backward-turned feet and long arms with sharp pointed claws. Some sightings of the Mapinguari have been brushed aside as possible misconceptions of giant sloths. But there are people who report actually having seen the creature in the heart of the jungles. Dr. David Oren, an ornithologist, strongly believed that Mapinguari wasn’t extinct. He had ventured into the Amazon forests, but the proof he collected to support his hypothesis wasn’t accepted to be valid. In the 1800s Florentino Ameghino, a paleontologist from Argentina had met an eyewitness who spoke about having seen a creature much like the Mapinguari in the southern areas of Patagonia. A girl from Brazil reported that she had once spotted a Mapinguari near her house in the Brazilian rainforest. One day, hardly 50 feet away from her house, she spotted a tall creature with long black hair. In 1937, in a small town called Barra das Garcas, a huge creature was reported to have brutally hunted down large herds of cattle from the town. The descriptions provided by the eyewitnesses matched those of a Mapinguari. The stories about the origin of the Mapinguari, state that it was originally a shaman in the Amazon. As it earned the wrath of the gods after it supposedly found the secret to become immortal, it was cursed to be born as a hideous creature wandering through the forests all its life. So do they really exist? There has been no solid evidence yet to support the fact that Mapinguari still exists. However,there have been several tribes who talk about this creature. The fact that the descriptions of the creature given by most of the tribes are strikingly similar also leads strongly to the belief that these creatures aren’t perhaps extinct after all. The local tribes also report that Mapinguari has a distinct horrible scent and that they flee to safety the moment they smell it. There has not been any reported incident of the Mapinguari attacking a human. Fossils have been also been found to support the theory that this legendary creature did not become extinct 8000 years ago. So are they still wandering the Amazon rainforests? Well, like is the case with many other extraterrestrial beings, the question remains unanswered to this day! 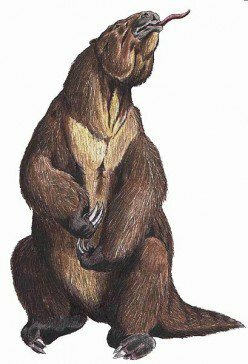 Mapinguari is maybe a giant ground sloth. This entry was posted in Cryptids and tagged Cryptids, Cryptozoology, Monster, Paranormal on November 21, 2016 by Gatekeeper. Very intriguing! Those jungles are so big that there could be an army of Mapinguari out there. Thanks John. Even today much of the rainforest remains unexplored and you never what could be roaming around.